While many Green Teams focus on recycling and waste prevention, some choose projects related to reducing the use of chemical products harmful to our health and the environment. Sheryl Havens, a teacher at Foster High School, taught her students about organic gardening and the effect pesticides can have on the human body and on the land, air, and water. The class grew vegetables vertically in small spaces as an example of how such gardens might work in apartment patios. 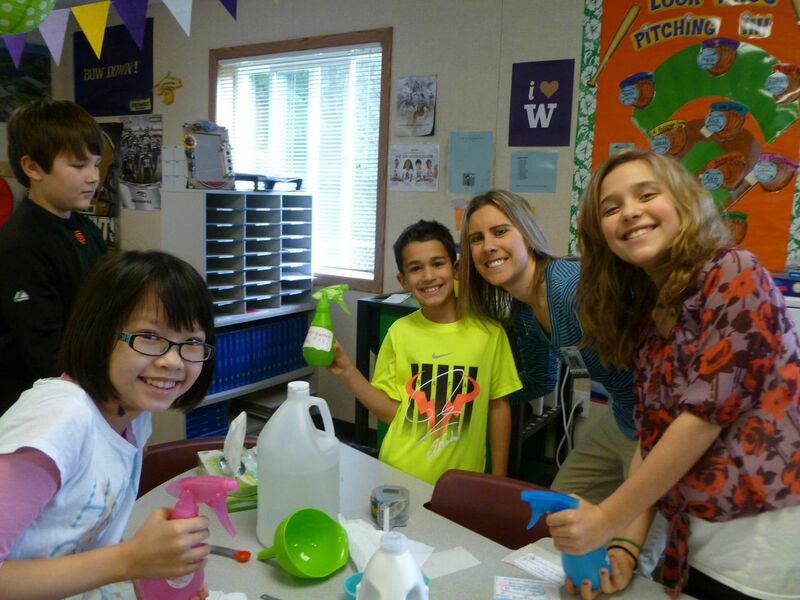 Fourth grade teachers at Island Park Elementary Lindsay Oliveira and Amy Kerby designed a project to encourage students to select environmentally friendly cleaning products. In turn, students assisted their families in doing the same. 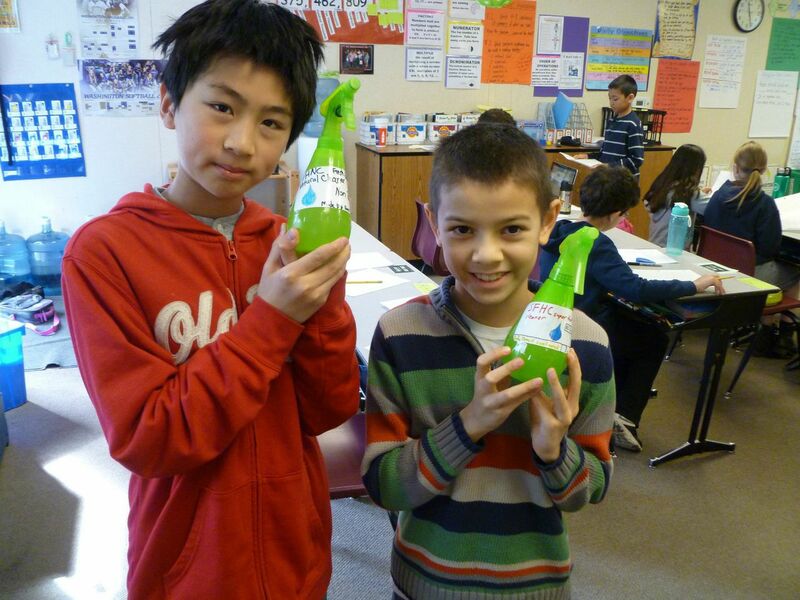 Students conducted a one-day, intensive project that involved writing a letter to their families about the health and environmental effects of cleaners, mixing a recipe for a non-toxic household cleaner, and designing a product label. Linda Murphy, fourth-grade teacher at Saint Edward School, used lessons from the Hazards on the Homefront guide (from the Local Hazardous Waste management Program in King County) on how advertising affects our choice of products and how reading product labels can lead us to choosing safer products. Students then made posters about what they had learned and hung them in school hallways before taking them home to share with their families. All of these teachers were inspired to conduct these projects with their students as a result of having taken the Hazards on the Homefront teacher workshop. At this workshop teachers become familiar with lessons from the Hazards on the Homefront teacher guide which engage students in designing and conducting science experiments to determine the health and environmental effects of household hazardous products. Students learn to identify what makes a household product hazardous, conduct a home survey of common hazardous products, understand how to make safer choices in their daily lives, and explore complex scientific questions. They also have the opportunity to put their learning into action through Green Team projects and community service activities. Teacher workshops will be held August 11 for Grades 4-6 teachers and August 12 for Grades 6-12 teachers at the Tukwila Community Center. There is also an optional tour of the South Wastewater Treatment Plant on August 13. Interested teachers can contact workshops@triangleassociates.com. ← Recycle Everywhere You Go!